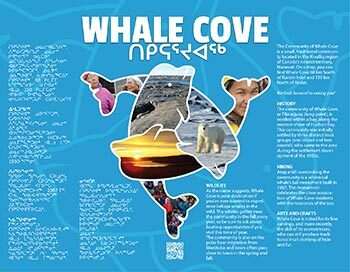 Traditional activities are still a mainstay and visiting Whale Cove will offer you once-in-a-lifetime experiences no matter what time of year you visit. Spring visitors can participate in the annual fishing derby, with community members competing for the biggest lake trout. Summer time means camping and hunting, while the fall is used as a time to gather berries and finish sewing clothing for winter. Berry picking is a popular activity in all Nunavut and Whale Cove is no exception. Gathering goose eggs and hunting small game, such as geese and rabbit, are also common. Wintertime is cold and dark, but regular activities help keep the community busy! Feasts featuring local games and homemade bannock are held regularly, as well as traditional games. Tea and bannock-making contests and other games help pass the time and provide much-needed social interaction throughout the winter months. People are friendly and love to share, so make sure you save time to attend feasts and games if you get the chance.